Many years ago I stumbled across a metal rocking chair that was as much a piece of sculpture as furniture. It was an immediate emotional reaction. I loved it. But would it be comfortable? Amazingly so, I discovered as I settled into it and rocked a bit. But I couldn’t afford the $3,000 price tag. Although I left the chair in the store, I couldn’t let go of it. Alas, when I went back, it was gone. And since it was a one-of-a-kind, there were no more. To make matters worse, the new owners of the place couldn’t remember where it came from or who made it. So it goes. More than a decade later, I still thought about that chair. Marcel Wanders, the Dutch designer, recently nailed it in a Wall Street Journal article when he noted that when you are looking for a chair, you should turn the question around. That is, find a chair that is looking for you. Find the chair that really needs to be in your house. My original feelings about that chair were that it needed to be here with me. Since I couldn’t find it or anything like it, I decided to have one made. Serendipity introduced me to Andrew Crawford, a blacksmith sculptor who was eager to take on the project. As a point of reference, he pointed me in the direction of Sam Maloof, an artist he had known who had quite a professional career designing and building great wooden rockers. So I designed my own version of my original obsession. Although the original inspiration I found in the shop was reminiscent of the Thonet bentwood design, my experience from working for Robert Currey at the original Storehouse in grad school was that they didn’t rock as well as one we called the Marimekko (the Finnish company best known for their bright silkscreen fabrics) rocker. It was a classic spindle back with a bright seat cover. So I started with that design and elongated the back and rockers. I also added a curve in the back spindles for more lumbar support and comfort. Andrew suggested a downturn at the back of each rocker to keep the heavy chair from tipping backwards with the momentum of hard rocking. The Heavy Metal Rocker was born in his shop in 1999, and has been on my deck ever since. I’ve had many hours of quiet pleasure in that rocker and much time for reflection. Many pleasant evenings in the Spring, Summer Fall and dead of Winter (in front of a fire in an iron chiminea). 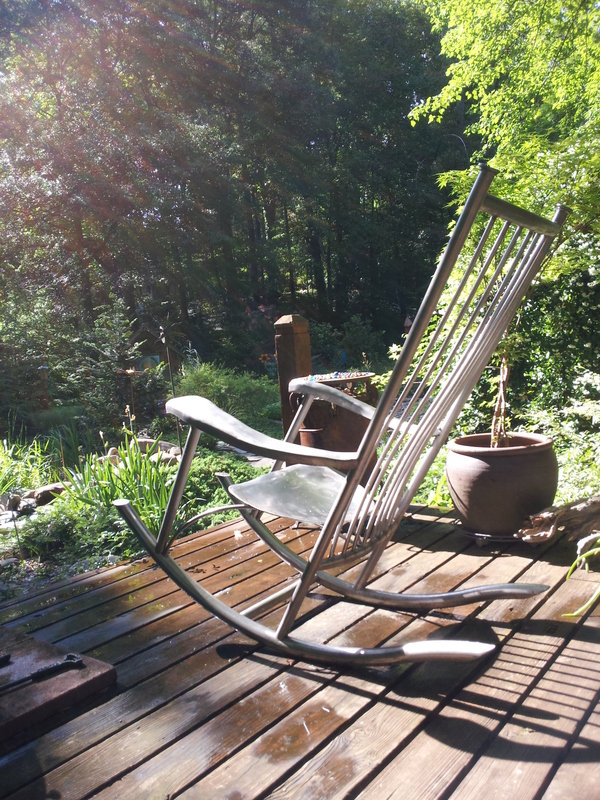 My evenings on the weekends aren’t complete without a visit to my rocker. A few years ago, it occurred to me that others might enjoy such a work of art that aids quiet enjoyment and reflection (often abetted by an adult beverage and maybe even the rare stogie). So I eventually re-connected with Andrew and he once again was enthusiastic about making similar pieces. The market is now open. If you’d like your own Heavy Metal Rocker, get in touch.